Last week for lunch I found myself in Barrhaven following a client meeting for my business and decided to visit another Spud's Potato Bar & Poutinerie (80 Marketplace Avenue, Ottawa) like my previous visit to one across town at the Elmvale Shopping Centre. 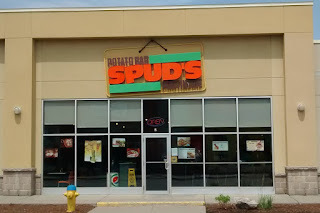 This Spud's is located in a large big box store plaza in suburban Barrhaven. This location is easily accessed either via the nearby parking lots off Marketplace Avenue or using OC Transpo's Marketplace Transitway station. I entered about 11:45 a.m. to an empty storefront with two employees behind the counter. 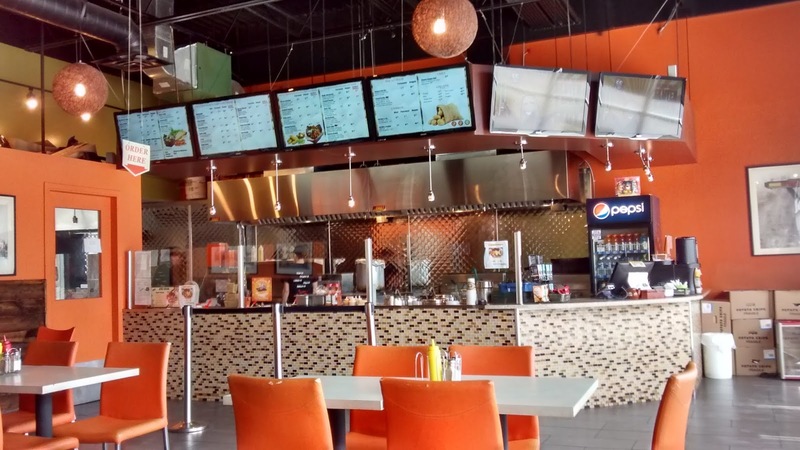 I appeared to be the first customer of the day as I walked up, reviewed the menus on the overhead digital screens and placed my order. The Order: 1 Macho Nacho Poutine and 1 500 ml bottle of Pepsi. The two ladies behind the counter started preparing my order as soon as the cash drawer closed on the register. I sat for perhaps five minutes reading the newspaper I brought with me. The interior is nothing special with traditional wooden restaurant tables for groups along with a counter running along the window for those singles wishing to people watch those passing by on the sidewalk outside. The main colour scheme is what I call "obnoxious burnt orange". Eventually my order was ready and I returned to the counter to pick it up and schlep it back to my table. 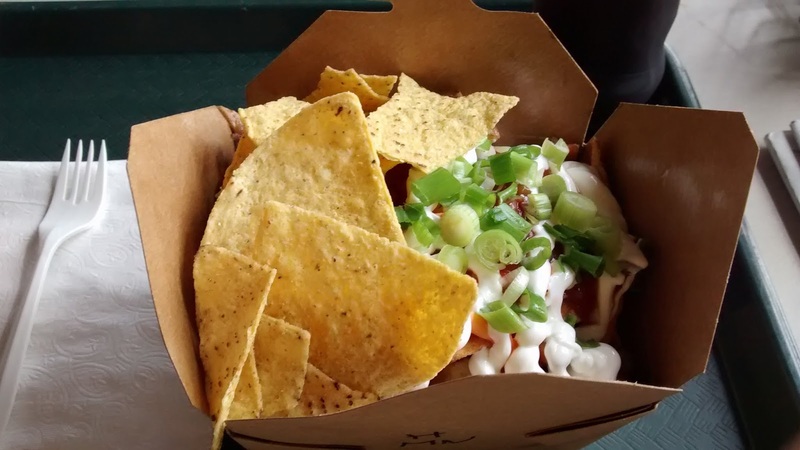 The Macho Nacho Poutine was interesting. It started out a little lacking with all the toppings tasting like they were just out of the fridge. My first forkful was unappealing as my tongue was expecting warm poutine fries with a side of ground beef nacho taste. Instead it was met with a mix of cold salsa and sour cream. I guess this dish is meant to be stirred like "fruit on the bottom yogurt" as the hot fries were buried underneath while the cold nacho style toppings were on the top. A little stirring seem to do the trick and I was finally able to enjoy a nacho themed poutine. 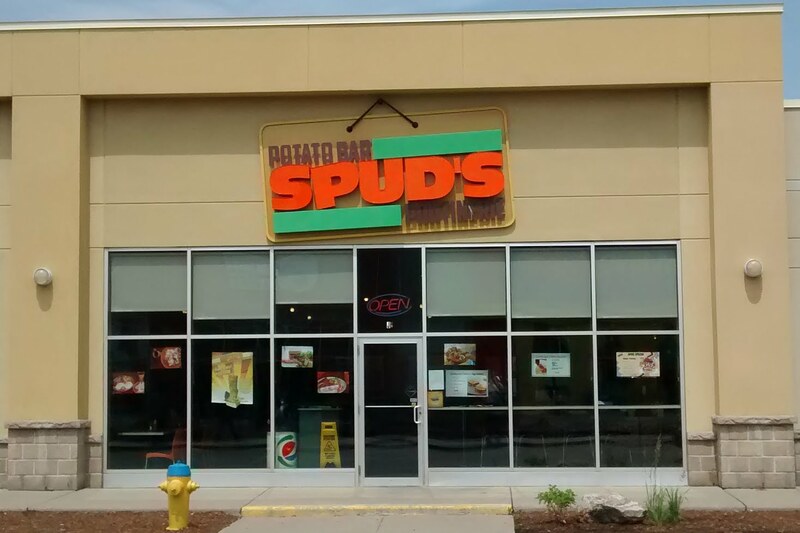 Overall, this Spud's Potato Bar & Poutinerie has decent service, but that was to be expected with two employees and only one customer. Later I found out one employee was in training which was perfect as it was a slow day for customers coming in the door. So kudos to Spud's for that! I enjoyed my meal and would definitely return if I was in the area.